Kevin Troy has several crowning achievements, to date: a principal role in Browncoats Redemption, by Big Damn Fan Films, premiered in Atlanta, GA in 2010 at DragonCon. He can also be seen on the big screen in Invasion, XXX2 State of the Union and Body of Lies. In addition, Troy hosted the television news program, Washington Roman Pictures News (WRPN). More recently, Kevin has delved into the role of writer & director – having produced his own web-series and subsequent feature film, Damned and working on newly written projects. -Carl Mason (Principal Role), CCL Productions Inc.
Kevin will work alongside how two teammates Tom Sanchez Prunier and Lew Fraga to bring The Amulet to full production through their talents and Lumbee River Productions Film School. Worlds Austin Sci-Fi film festivals. 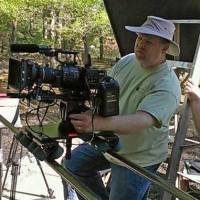 Lew Fraga has more than 25 years experience in still and motion imaging, photo finishing and independent filmmaking. He was a producer, writer, director and the cinematographer for the web series Phenomena: Probing the Paranormal, and has filmed dozens of promotional videos and commercials. The owner of Fraga Studios, Lew is an award-winning illustrator and member of the American Society of Media Photographers and the National Association of Photoshop Professionals.